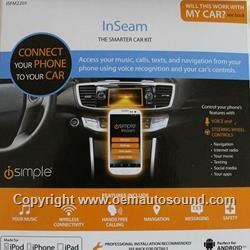 This is not a simple Bluetooth car kit, but goes beyond the hands free or streaming your music by allowing you to Control your Smartphone via Voice Recognition. The interface allows you to give verbal commands to your phone or by simply pushing a button on the steering wheel, then saying the name of the application aloud the commands depend on the VR application chosen by the user. need to touch the device. current speed exceeds a preset speed-limit.